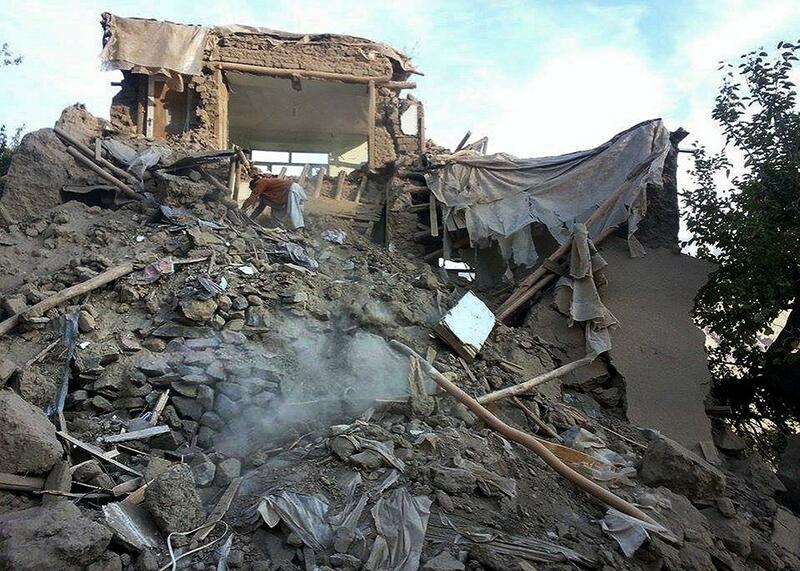 Afghanistan and Pakistan earthquake is deadly. 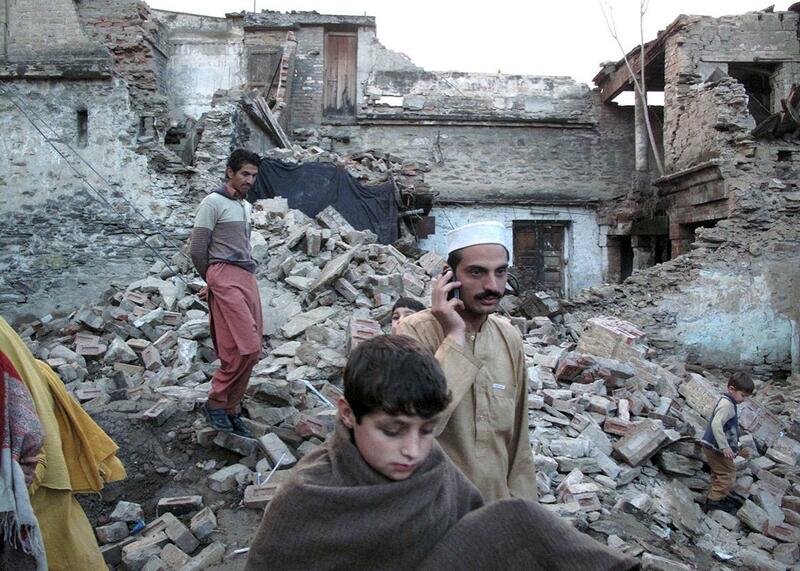 Residents walk past the rubble of a house after it was damaged by an earthquake in Mingora, Swat, Pakistan, Oct. 26, 2015. A strong magnitude 7.5 earthquake struck Takhar province in Afghanistan around midday local time on Monday, according to U. S. Geological Survey data and media reports. The New York Times reports that, upon feeling the quake, people rushed to the street in Kabul, 160 miles away, where the shaking lasted about two minutes. At a girls’ school in Takhar province, 12 students died and another 40 were injured in a stampede. The Guardian showed video footage of a landslide that was triggered in neighboring Pakistan, more than 600 miles from the earthquake’s epicenter. The BBC reports that buildings were evacuated as far away as New Delhi, where the tremor was felt. The U.S. has had a significant military presence in Afghanistan since 2001. Earlier this month, President Obama committed to keeping 5,000–10,000 soldiers through the end of his presidency, though there was no immediate indication of how the earthquake may have affected U.S. citizens in Afghanistan. An Afghan man digs through the rubble of a damaged building after a powerful earthquake in Raman Kheel village in Panjshir valley on Oct. 26, 2015. The earthquake occurred near the remote Hindu Kush region of Afghanistan, where the Indian subcontinent is moving northward toward the rest of Eurasia at the rate of about one and a half inches per year. This slow-motion collision has formed the Himalayas, the tallest mountains in the world. Though the region is known for its frequent powerful earthquakes—a 7.7 struck Pakistan in 2013 and 7.9 hit Nepal earlier this year—Monday’s quake was about the strongest that can be expected in this part of Afghanistan. The USGS says there have been only seven earthquakes in the region in the past century stronger than 7.0. The impact is likely to be severe. Right now, at least 129 people are reported to have died in Afghanistan and Pakistan. But the PAGER algorithm, designed by the USGS to give an instant assessment of an earthquake’s humanitarian toll, shows the final death count should be close to 1,000. An estimate from the USGS PAGER algorithm shows about 1,000 may have been killed in Monday’s earthquake. As Slate’s Joshua Keating wrote after the 2013 Pakistan earthquake, death tolls can be a crude and misleading measure of an earthquake’s impact, especially in remote and vulnerable parts of the world the foothills of the Himalaya in Afghanistan. If past major earthquakes are any indication, today’s news reports (most of which require verification from official sources, which is hard to come by) will likely vastly understate the number of people affected.